While the mobile C-arm market has seen a small but continuous demand for image intensifiers, flat-panel detectors, specifically with CMOS technology as an alternative to amorphous silicon detectors, are driving new releases. 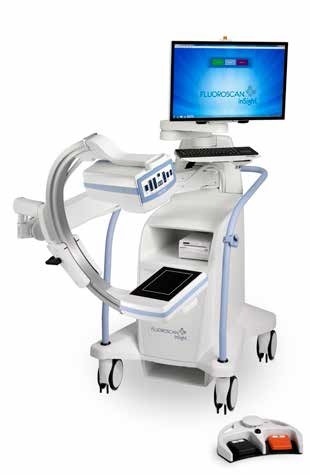 GE Healthcare’s OEC Medical Systems, one of the last manufacturers to solely offer the older technology, last year released its first C-arm with a flat-panel detector, showing that times are definitely changing. Here’s a guide to what’s new in the space. GEMSS North America is releasing two new C-arm models this year. The first, coming out in the second quarter of 2017, is a 12-inch version of the company’s Spinel 3G, a nine-inch image intensifier. Both units run on the new CX View 3.0 software, which came out in the middle of last year. The company is also hoping to get FDA clearance for the 12HD, its flat-panel detector. The 12HD will have a 15.3-inch flat-panel detector, a larger arc and an arm-mounted control panel that swivels from side to side. The larger field of view will be beneficial for vascular labs and orthopedic and urology practices, says Gary Kohler, vice president of sales and marketing for GEMSS North America. “That’s really the high-end flagship,” Kohler says. “We felt that there’s still a good market for image intensifiers without a doubt, but there is more need that we have noticed for a larger field of view. That’s why we’re adding the 12-inch and flat-panel, because that’s where things are headed.” All of its systems are sold through a network of 74 independent dealers covering all 50 states and Puerto Rico. In March, Hologic debuted an update to its InSight software that creates a low-dose mode, which gives a 50 percent lower dose than the current system, says Laura DiGangi, the company’s associate product director of global marketing. The low-dose mode decreases the frame rates to 15 frames per second with clinically equivalent imaging, according to DiGangi.